Just fill out the Entry Form and you will be entered into the Spring Family Vacation Giveaway and the Summer Family Vacation Giveaway (one entry per person only.) Winner will be notified by email and certified mail on May 24, 2019 for the Spring Getaway and on October 25, 2019 for the Summer Getaway. Prizes must be claimed via email or phone within 30 days of contest drawing or winner will forfeit prize. Prizes are subject to change without notice. Everyone who fills out the entry form on the WildwoodsNJ.com contest website is eligible to win*. No purchase is necessary. Only one entry per person allowed. Multiple entries will invalidate all of your entries and you will not be eligible for the contest. By entering one time, you are eligible for both the Spring Vacation Contest which will be drawn on May 24, 2019 and the Summer Vacation Contest which will be drawn on October 25, 2019. 3-Day, 2-Night stay in a Wildwoods Hotel-Motel of your choice! The winner of the Spring Family Vacation Getaway drawn on May 24, 2019 must use their prize package prior to August 29, 2019. The winner of the Summer Family Vacation Getaway drawn on October 25, 2019 must use their prize package prior to August 27, 2020. GWTIDA, its affiliates, partners or employees are held harmless from any liability or lawsuit arising out of conditions associated with usage of any of the prizes. GWTIDA reserves the right to permanently disqualify any person if they believe that person has intentionally violated these rules. By entering one time, you will be eligible for the two Grand Prizes of a 4-Day, 3-Night Family Vacation in the Wildwoods. The winner will be selected by random computer drawing and will be notified by email and certified mail. Winners must claim their prize via email or phone within 30-days of the drawing. Any prize not claimed within the 30 day period will be forfeited. A valid government photo I.D. is required at check-in. Results of all prize drawings will be posted on the WildwoodsNJ.com website and announced on the Wildwoods’ social media pages. All entries must be received by May 24, 2019 and October 25, 2019 to be eligible. All transportation, taxes, gratuities, duties or fees are the responsibility of the winners. Winners agree to allow his or her name and likeness to be used in promotional materials and advertising without further compensation. Accommodations are based upon availability, Monday through Thursday occupancy only. Certain restrictions and black-out dates may apply. Prizes must be claimed no later than June 24, 2019 and November 25, 2019 respectively, or winner will forfeit prize. All decisions by contest judges will be final. Employees and immediate family members of employees of GWTIDA, The Wildwoods Convention Center, The NJSEA or their affiliates, SMG Corp. and Delaware North are ineligible to participate. We value your privacy and will not give, sell or rent your e-mail address to any third party. If you decide to share your contact information, you may receive occasional news, updates or mailings from the Greater Wildwoods Tourism Improvement and Development Authority or the Wildwoods Convention Center in the future, but you will have the ability to opt-out of that communication at any time. 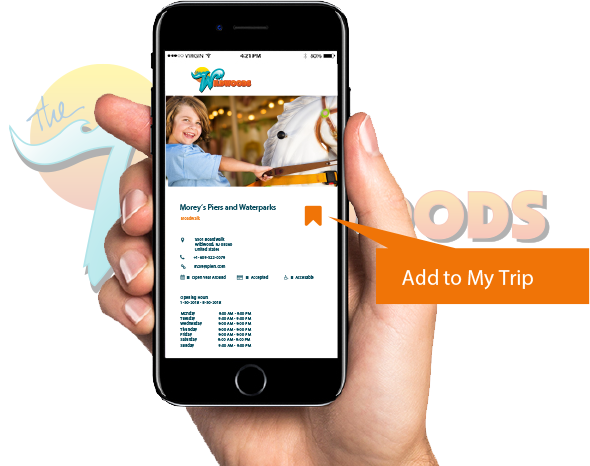 Use our interactive tool to select your favorite events and attractions and save them to your itinerary at the push of a button. You can organize your trip from your computer or phone so you can make the most of your trip. Select your trip duration and start flagging things you’d like to do. Any of the items in our Plan a Vacation section can be added to the My Trip section of our site. When you are finished you can save your trip, print it out or share it with your friends and family. Click on the My Trip page at any time to get started or visit our Trip Builder pages for step by instructions.